This story encapsulates how much the media ignores stories from the territories that don’t involve Israel. Last night, many members of the Eshtewi family held a protest outside the home of Hamas leader Ismail Haniyeh in Gaza. One of their sons, Mahmoud (in some reports Abul Magd) has been in Hamas prisons for months without charge. The family demanded that Haniyeh come out to talk to them, and they chanted slogans and held up banners. 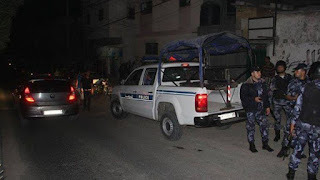 Hamas police came and started beating them, injuring a number of family members including a female journalist Buthaina Eshtewi, and two brothers were arrested and taken away to an unknown destination. In the grand scheme of things, this is not that big a deal. But the complete absence of any western media ever reporting stories like this while eagerly reporting on similar stories that can be blamed on Israel reveals a much bigger issue here. Even if the media does not consider this newsworthy, “pro-Palestinian” NGOs would be expected to be compiling statistics of these sorts of events, and issuing annual reports counting the number of arrests, beatings, imprisonment without trial, cases of torture, people killed by police – all the statistics that are being zealously kept and often inflated by these same NGOs against Israel, even though they often claim that they are non-partisan. Journalists, NGOs and diplomats have an unwritten agreement to ignore these sorts of stories to ensure that the news that filters out to the world is one-sided against Israel. The tiniest anti-Israel stories in the Hebrew press get translated and quoted prominently while Arabic stories like these get ignored. The decision as to which stories get coverage is not newsworthiness or the level of human rights being violated. No, the major decision-making is based on a single factor: whether the Jewish state can be properly blamed. This ensures that generations of young people are brought up on biased, one-sided news stories based on simplistic memes of Jewish oppression and Arab victimhood.. It takes real effort to find out the truth and practically no one will spend the time, since there is an assumption that the news media will do their jobs. And the very people who should investigate this bias are the people who practice it. This particular case is not a big story. But the situation that causes stories like this to be ignored day in and day out is indeed a very big deal.